State-sponsored terrorism, WMD - what the US goes to war over today (even if it turns out they don't exist) was all happening in New Zealand and the Pacific two decades ago. YOUNGER New Zealanders could be a little confused by last year's 20th anniversary of the bombing of the Rainbow Warrior. Where did this happen? In little old Auckland Harbour. Who did this? The French. Why? Well, they didn't want the Greenpeace boat to sail to Moruroa atoll, in French Polynesia, where they were testing nuclear weapons. State-sponsored terrorism, WMD - what the US goes to war over today (even if it turns out they don't exist) was all happening in New Zealand and the Pacific 20 years ago. Attention here has always focused on the bombing on July 10, 1985 - which killed photographer Fernando Pereira - and the subsequent capture of the culprits and the politics that followed. But David Robie had boarded the Rainbow Warrior in Honolulu, 10 weeks before she sank in Auckland. 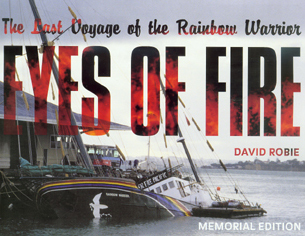 Robie has never been a member of Greenpeace, but in Eyes on Fire, reprinted here in a memorial edition, he traces the history of the boat and what is now a worldwide environmental organisation and gives you some idea of why the French went to such lengths to stop her. The Rainbow Warrior and her crew had a knack for putting themselves in the way of (and slipping away from) authorities and gathering international attention wherever they went. And 1985 was to be the Year of the Pacific. As expected, Greenpeace found the palm-fringed islands of Micronesia far from idyllic. Before arriving in New Zealand the Rainbow Warrior evacuated the people of Rongelap Atoll, in the Marshall Islands, which had been contaminated by nuclear testing. This was not a publicity stunt or even a campaign typical of the ecology movement, said Robie, who was a journalist specialising in the Pacific and is now an associate professor in Auckland University of Technology's School of Communication Studies. Today, when terrorism is usually only as close as the news headlines, looking back at how it was practised in New Zealand is interesting. And useful, if you want to ask: Could it happen again? Copyright © 2006 David Robie and Asia-Pacific Network. This document is for educational and research use. Please seek permission for publication.